Every year I visit Mumbai numerous times for my work. Sometimes as a journalist or a blogger and at times as a consultant and even a jewellery stylist. Mumbai as a city offer unlimited opportunities for the jewellery industry. 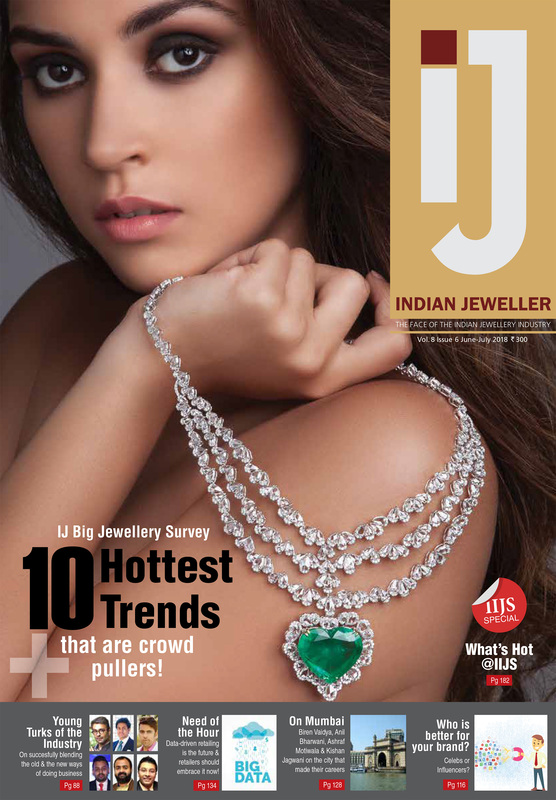 Therefore, this IIJS (India International Jewellery Show), I thought of doing a story on this wonderful city. The story has been published in the June-July 2018 issue of Indian Jeweller magazine. I hope you agree with my opinion as well as that of four leading jewellers who have contributed to my story. People from various parts of the country come to Mumbai to make a living because, it is unequivocally the city of dreams. Leading jewellers converse about this maximum city, a city that gave them a bounty of opportunities, a city that made their careers and allowed their businesses to flourish with Preeta Agarwal. 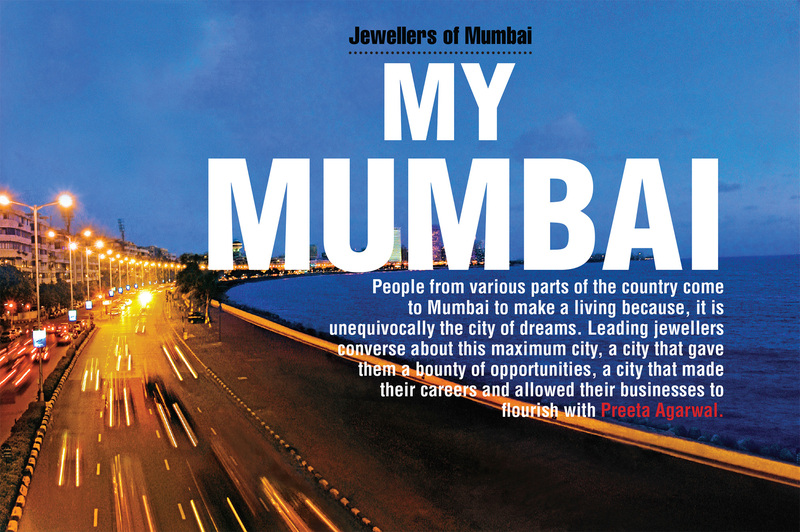 One city that holds a special place in the hearts of all jewellery professionals is Mumbai. The fashion capital of India is also the jewellery capital of India, not just because of the number of jewellers, manufacturers or exporters that are based in Mumbai but due to sheer love that this city has for jewellery. Jaipur might rule the charts of being the first jewellery focused city of India, but Mumbai is like a magnet to anybody with business acumen – it is not a wonder why it is the hub of the Indian gems & jewellery industry. While there were always jewellers making and selling jewellery in Mumbai, it was in 1975, with the construction of the Panchratna building that the trade gained momentum.With a run of over 2 decades and due to the need of a larger, more secure space, BKC came into being which houses offices of various jewellery companies, and now India’s first ever Diamond Bourse. Why did you decide to set up your business in Mumbai? I have been born and brought up in Mumbai all my life. There is honestly no other place I can imagine myself working in. Since I was the first generation in the business, I utilized my social connections to start out in the jewellery business. the retail of jewellery with the launch of the Rose Salon in 2004. Why is Mumbai so special for the jewellery industry? Even though traditionally most artisans come from Bengal, Mumbai has always been the epicenter for buying and selling gemstones and thus by default, has become the center of the jewellery manufacturing industry. Being the commercial capital of the country, Mumbai has always been the hub of major businesses in India and thus, has a sizeable retail market too. Therefore, Mumbai holds a unique place in the jewellery industry, as it is not just the manufacturing center but also the retail center of the industry. How close-knit is the jewellery fraternity in Mumbai? The Mumbai jewellery fraternity is largely formed of two major Indian communities –Gujaratis and Marwaris. Since these two communities have very similar social and cultural values, the fraternity is very close-knit. With so many players concentrated in one city, competition must be tough too? city to live and work in, as it is very pro-business. So honestly, there are no complaints. What is the one thing about Mumbai that attracts you the most? It is a city that never sleeps. There is no city that can match Mumbai’s pace and energy! called ‘Motiwala’ and thus, we got our surname. His son, my great grandfather saw the opportunities that this city provided and decided to relocate to Mumbai. I have been in Mumbai all my life! But for the family, my great grandfather and his brother relocated to Mumbai more than a century ago in 1905.
very important role in shaping the city’s distinct lifestyle that clearly reflects in the jewellery. Mumbai is open to design ideas and experiments and is open to taking risks. And, with so much money to spend, clients want to see new designs every time they walk in, literally keeping us on our toes! How close knit is the jewellery fraternity in Mumbai? The people of the industry are quite close to each other. Whenever there are any new changes in laws/policies, the industry stands together to find a solution. Having the presence of associations and organizations like GJEPC also helps build newer bonds by giving us opportunities to meet, network and grow together. Some competition is always healthy for everyone. One can differentiate by building a good range of designs, store ambience and service standards. But, yes some are selling lower quality goods, spoiling the market, but I guess one needs to pass the test of the time in order to build a loyal clientele and trust. “Work hard and party harder,” is a clear motto of this cosmopolitan, ever evolving city and people from all religions enjoy living here equally. my gemmology course at the Gemmological Institute of India, which was at that time the only institute of its kind in India. Being the diamond and jewellery hub of India that offered a hoard of opportunities, I ended up staying here. Since I moved here, I have fallen in love with the city. I truly appreciate the no nonsense attitude towards work that Mumbai has, be it the dealers, traders, manufacturers, stockists etc. Even the skilled artisans and goldsmiths working in Mumbai are hard working and not lazy. am still associated with most of my vendors and skilled artisans with whom I have been working for the last 25 plus years. It’s like any other business. There is a lot of competition, both healthy and unhealthy but there is space for everyone. was successful I decided to move ahead and start a flagship store in Bandra in 1983. I’ve been into this business for almost a century now. The true essence is the welcoming atmosphere of this industry. The designs, the jewellery and the services can be replicated but the vibe and energy can’t be. The industry is extremely welcoming and open to new ideas and proposals. The bond is indeed very intimate. We help one another wherever required while still maintaining our privacy. The key is to not foster bad blood between our relationships with other jewellers but build healthy friendships. With so many players concentrated in one city, the competition must be tough too? your limits and helps you grow. Competition is one of the reasons why we are where we are today. Mumbai’s lavish and delicate diversity is what attracts me the most. People living here come from different cultures and backgrounds and it’s interesting how they learn to adapt to the culture here and keep up with Mumbai’s pace.